I love being back in my kitchen! 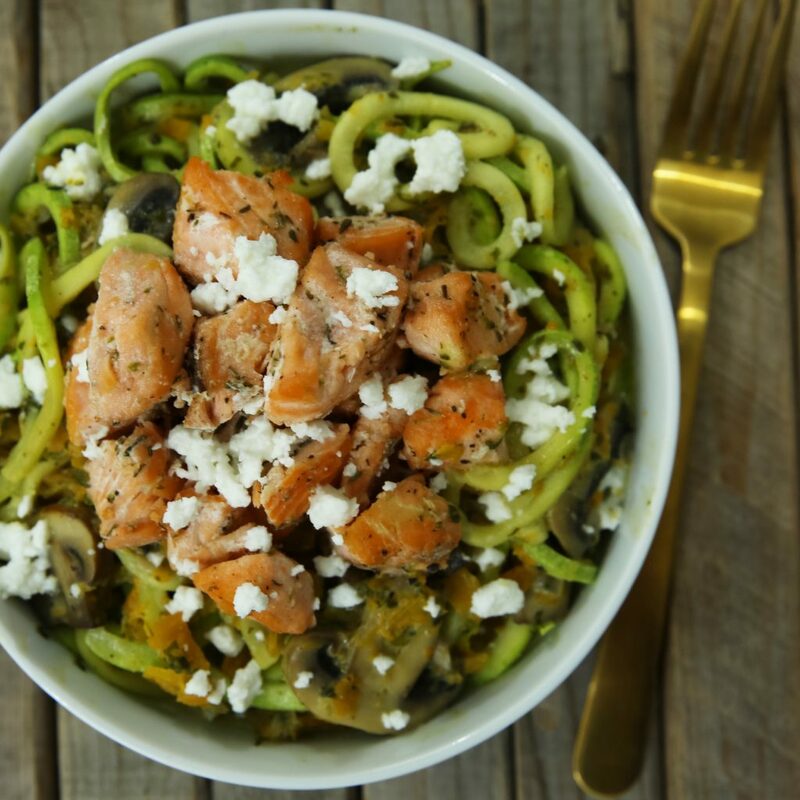 I was so excited to try out my Spiralizer that I couldn’t even wait a day to use it! Little did I know that I chose the hardest vegetable to use it with, but it was all worthwhile. What I thought would be butternut squash and zucchini noodles ended up being just zucchini noodles with the butternut squash coming out more ribbon-like. Anyway, they both ended up mixing into the sauce really well! Honestly, this dinner wasn’t quick, but that had more to do with the effort it took to Spiralize the butternut squash— actually, the sauce and fish are pretty quick so definitely use it to top of some plain old pasta and turn a boring dinner exciting! In a large sauté pan heat up the olive oil and butter. Add in the salmon cubes and cook for around 5-7 minutes until cooked through. Remove to a plate. In the same pan add in the onions and sauté until golden. Add in the mushrooms and garlic and sauté until the juice evaporates. Add in the sherry and reduce. Slowly stir in the flour, mixing well so it doesn't clump. Add in the heavy cream, water and spinach and cook until thickened. Add in the salt, pepper to taste and the butternut squash. Cover and allow the butternut squash to cook and soften for around 15 minutes. 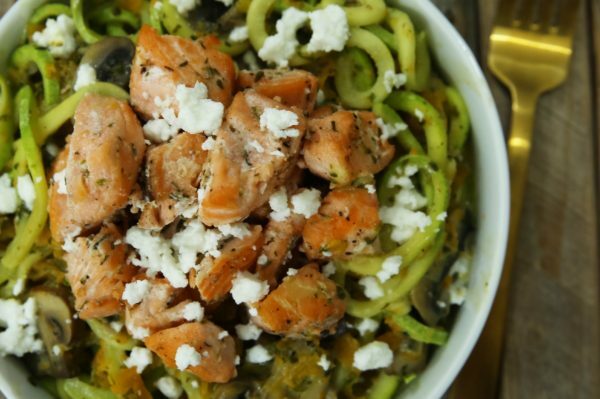 5 minutes before serving and in the zucchini noodles, feta cheese and salmon and cover the pot. Cook for 5 minutes and serve hot. If making this dish on Passover just substitute the flour for tapioca flour (starch). Create a slurry though before adding it to the mixture so that it won't clump. Mix together the 2 tbsp of tapioca flour with 2 tbsp water and whisk until smooth.